The second biggest dam after the Three Gorges project is likely to have contributed to reservoir-induced earthquake and massive deadly landslide. “The China Three Gorges Corporation has developed important technologies including precise blasting, digital cooling and grouting, intelligent vibrating and temperature control, which ensured no temperature cracking during the 6.8 million cubic meters dam concrete pouring.” “The innovative ideas and technologies of the Xiluodu Project have given the project a leading position in the world in intelligent construction of mass concrete structures, which has successfully solved the dam crack problem, a world class difficult issue,” said Professor Luis Berga, Honorary President of International Committee on Large Dams . 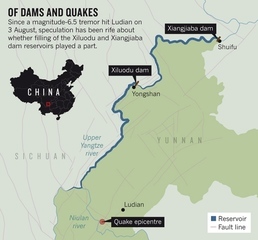 Despite these words, local media outlets such as Sichuan Online and Sichuan News Network reported about a giant landslide in the newly filled Xiluodu Dam reservoir located on the lower Jinsha River around 17:00, July 27th 2013 (Beijing time). The landslide, measuring 200 metres wide, 250 metres high and 120,000 cubic metres in total volume, ripped through Huangping Village of Huanghua Town in Yongshan County of Yunnan Province before flowing into the Jinsha River, where it caused tsunami waves as high as 20 metres, washing over to the opposite shore of the Jinsha. According to news posted by local governments in both Yunnan and Sichuan provinces, at least 12 people, caught by the waves, remained missing, including workers working on the construction of a pier, passers-by, and five teenagers between 13 and 16 years of age. 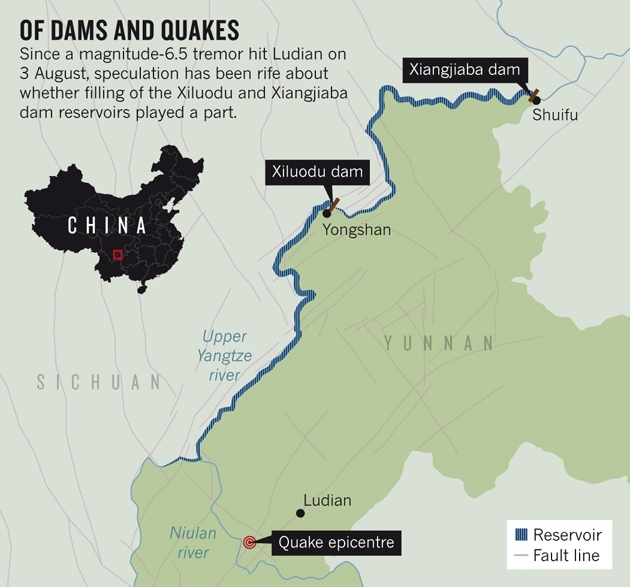 According to geologists, intensive dam building on the Upper Yangtze might be partly also behind the 6.5 magnitude earthquake that killed more than 600 people and displaced nearly 300,000 in August 2014 . In the words of Yang Yong of the Hengduan Mountain Research Institute: "It’s like a balloon that remains stable, or slowly deflates, when there are no external pressures. But when there is external pressure, such as from a needle, it suddenly bursts. Reservoir earthquakes are like that needle. You can’t assume all reservoir earthquakes will be small." The Xiluodu hydroelectric power plant on Jinsha Jiang River, China, was inaugurated in September 2013. It was fully operational in June 2014, becoming the world's third biggest arch hydroelectric power plant, in terms of installed capacity. The primary purpose of the dam is hydroelectric power generation and its power station has an installed capacity of 13,860 MW. Additionally, the dam provides for flood control, silt control and its regulated water releases are intended to improve navigation downstream. As part of a cascade of dams, including the Xiangjiaba (which is currently under construction), Baihetan, and Wudongde, the Xiluodu seeks to alleviate much of the sedimentation that has been rapidly accumulating behind the Three Gorges . It stands as the second largest hydropower project in China behind the Three Gorges Dam. The dam is located on the Jinsha River (the upper Yangtze River) on the boundary between the provinces of Yunnan and Sichuan. The electricity generated from the left bank power house is sold to State Grid Corporation of China. The electricity from the right bank is sold to China Southern Power Grid. The respective electricity sales contracts were signed in July 2013. It will also displace an estimated 180,000 people, mostly from the city of Zhaotong. 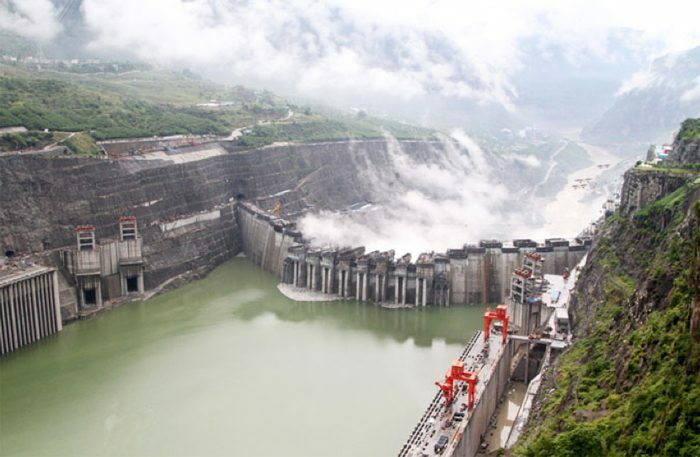 All four dams are currently being constructed by the Three Gorges Project Corporation (CTGPC). And similar to the Three Gorges, the construction site of all four dams is located near an earthquake zone, which poses real dangers, such as landslides, to local inhabitants. Once completed, fertile farmlands will be flooded, and river fragmentation will threaten the already precarious migration of economically important fish . Huangping Village of Huanghua Town in Yongshan County of Yunnan Province, where the landslide occurred, is located in the backwater zone of the Xiluodu Dam reservoir. According to the Chinese geologist and chief engineer of the Regional Geology Investigation Team of the Sichuan Geology and Mineral Bureau Fan Xiao: "Lessons need to be drawn from landslides that have occurred in the Three Gorges reservoir area and landslides in China’s other large reservoir regions. As these cases demonstrated, periods in which water levels rise sharply or fall rapidly are usually dangerous because they can trigger geological disasters or exacerbate geological instability. These cases include the big landslide in Qianjiangping when the Three Gorges reservoir was filled to 135 metres for the first time in July 2003, and the large landslide at Gongjiafang when the Three Gorges reservoir was filled to 172 metres for the first time in November 2008, and so on and so forth. Both the spatial and temporal analysis of the landslide that occurred in Yongshan County in Yunnan Province last Saturday indicate that the impoundment of the Xiluodu Dam reservoir most likely caused this incident. More such incidents will occur again and again in the future because, according to the impoundment schedule, the Xiluodu reservoir will be filled to its NPL (normal pool level) of 600 metres (above sea level) by 2014." In the words of the environmentalist Ma Jun, author of “China’s Water Crisis, “These large dams will have a lot of impacts, sometimes irreversible. We have to look at them very carefully and follow our legal requirements very strictly.”  New laws require dam projects to undergo environmental impact studies and also provide opportunities for public comment and oversight. But those laws are easy to circumvent, or ignore. Xiluodu, for example, is being built in a national protection zone for several species of endangered fish. Environmentalists worry that these systems create a domino effect in which one mega-dam begets another. Project Details The height of the Xiluodu reaches 285 metres, with a crest elevation of 600 metres, its reservoir capacity is 12.67 billion cubic metres and its total installed capacity is 13,860 MW. the reservoir is 200 km long and average width of 700 m. Total cost approached 10 billion USD. The Xiluodu dam is a double-curvature arch, concrete dam with a height of 278m and width of 700m. The reservoir has a total storage capacity of 16.5 billion cubic yards, of which six billion cubic yards are for flood control. The flloded land is 41843 mu, equivalent to about 3000 ha. The Xiluodu River flow through the dam is controlled using five massive control gates, including a 1,600t gate, which is the world's heaviest control gate, and four other gates weighing 1,200t each. The fixed hoist headstock gears operate the gates that block the water. The Xiluodu-Zhejiang HVDC transmission project transfers the electricity generated at Xiluodu to Jinhua, Zhejiang. The transmission line stretches up to 1,680km and has a transmission capacity of 8GW. The transmission project was worth $3.9bn. The Xiluodu-Guangdong HVDC project is a double 500-kV bipole system with a transmission capacity of 6,400MW. The power is transferred from Zhaotong station in Xiluodu to Conghua station in Guangdong via 1,286km-long transmission line. Impoundment of the Xiluodu Dam began on May 4, 2013, when, beginning at 440 metres above sea level, it was filled to a height of 540 metres. The first phase of impoundment lasted only 51 days but the increase in water level reached 100 metres, far higher than that of the Three Gorges reservoir which only increased 65 metres in its first phase of impoundment, while the Xiangjiaba Dam reservoir (on the upper Yangtze) increased 76 metres. Due to rapid filling of the Xiluodu reservoir, shipping traffic below the dam in the Luzhou section of the Yangtze was severely affected. Run-off from upstream was only 35-56% of the average for the same period in 2012; the water level of the Erlangtan in downstream Luzhou City declined to 0.18 metres from 1.4 metres during the period of reservoir filling. Yueping, Y., Bolin, H., Shichang, W., & Jinhe, L. (2015). Potential for a Ganhaizi landslide-generated surge in Xiluodu Reservoir, Jinsha River, China. Environmental Earth Sciences, 73(7), 3187-3196. China Dilogue. Yunnan earthquake linked to dam-building, says Chinese geologist. Liu Qin 20.08.2014. 中文版本 The earthquake that devastated Yunnan province on August 3 is linked to world’s largest and most intensive dam-building scheme on the Jinsha River, says geologist Yang Yong.